Charlie's sister Pat made this quiche for us when we visited her in August 2010. Pat calls this Curves Quiche. It was delicious. Note that it doesn't have any flour in the crust, only vegetables and a tiny bit of corn meal, so it's low-carb and gluten free. We've modified the original recipe slightly: made a much thicker crust (because it's so good) and replaced fat-free half and half with low fat sour cream, because that's what we had and it worked great and what the heck is fat-free half and half, anyway? It's fun and easy to make. Makes 1 pie, approx. 6 servings. (We usually double the recipe to make 2 pies. Crust looks burned in the picture but that's just the browned spinach. Delicious. Optional but highly recommended: If you have some fresh tomatoes, slice 1/8" to 1/4" thick and spread a layer on top before cooking. Very pretty and taste fantastic. Add spinich, salt and pepper and cook a few minutes more. Lightly grease a 9" pie plate (cooking spray works well). Press crust mixture into pie plate and shape as a crust. In separate bowl, beat eggs, sour cream, salt, and pepper. 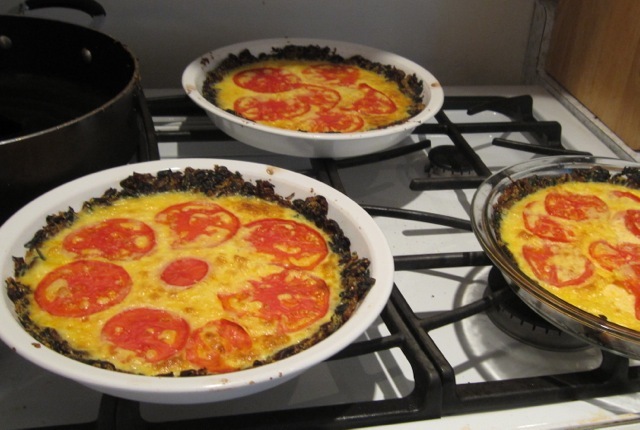 Fold in cheese and any other filling ingredients, except tomatoes. Add a layer of fresh tomato slices on top, if you're doing that. Add chopped garlic to the crust. Experiment with different kinds of cheese. Heck, it might be good with blue cornmeal instead of yellow cornmeal.